This hearty, casserole-type bread and potato stuffing need not be stuffed into anything; simply enjoy it as a side dish. This is welcome at the Thanksgiving table, but you can surely enjoy it any time you want a comforting casserole or have a bit of bread you’d like to use up, like those end pieces that no one seems to want. 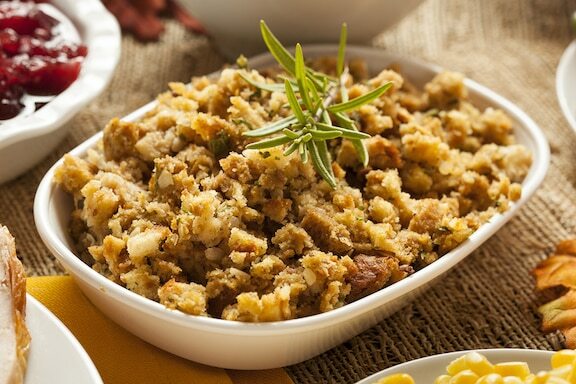 This hearty, casserole-type bread and potato stuffing need not be stuffed into anything; simply enjoy it as a side dish. Once the cooked potatoes are cool enough to handle, peel them and place them in a large mixing bowl. Coarsely mash the potatoes with ½ cup of the rice milk. Cut the bread into ½-inch dice. Place them in a small mixing bowl and pour the remaining rice milk over them. Soak for several minutes. In the meantime, heat the oil in a medium-sized skillet. Add the onion and celery and sauté over low heat until the onion is lightly browned and the celery is tender. Combine the onion and celery mixture with the mashed potatoes in the large mixing bowl. Stir in the soaked bread, and seasoning mix. Season to taste with salt and lots of pepper. Pour the mixture into a well-oiled, 2-quart baking dish. Bake for 50 to 60 minutes, or until the top is a crusty golden brown. Could this be made a day or few hours in advance and reheated? What would your recommendation for that be? Hi again, Christine. This one can be made up to 3 days in advance. Unlike my previous answer to you on the Pueblo Corn Pie, I’d say bake this one all the way through, otherwise the bread might get mushy if it stands too long. Then cover with foil when reheating.